SYNCRO provided comprehensive architectural and engineering design services for the transformation of the turn-of-the-century auditorium into a state-of-the-art studio theater for multiple stage/audience configurations. 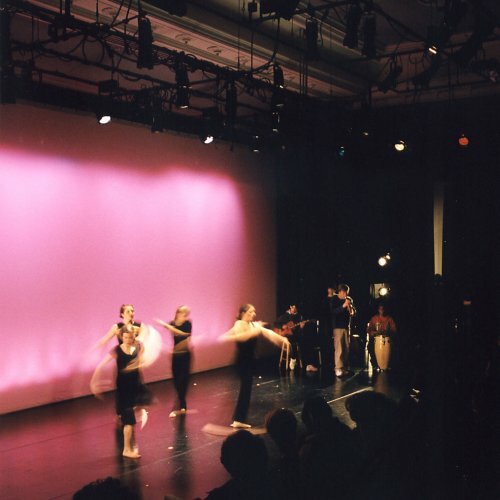 A variable acoustics curtain system was designed by acoustical consultant David R. Harvey to suit productions ranging from 4th grade violins to choral groups to jazz and rock bands. A mobile control booth for lighting and audio-video was proposed and designed by the design team – a unique solution to allow ideal positioning for multiple configurations in a small space. This custom fabrication provides a platform for hands-on education of theater technology. Several historic details were restored and featured in the renovation. The existing raised decorative plaster ceiling cove was repaired and re-used for house lighting. The theater lighting pipe grid was designed with a raised central portion to accentuate the sculptural ceiling. A stained-glass window had been covered with construction for years. It was restored and featured. An new, low-velocity HVAC system was designed to fit atop the adjacent roof and distribute through the existing attic space. New utility connections and building services were incorporated into the project to accommodate the growing demands of the school. Posted in civic and cultural, educational, workplaces. RSS 2.0 feed.